Meaning: This blog post is particularly relevant for my American friends this patriotic weekend, and for any foreigners who are thinking of traveling to Australia for a summer holiday in a few months. An esky is the Aussie name for a cooler. Get it? because esky is short for Eskimo, and Eskimos live in the snow where things are kept cold! HA! Like band-aid, esky is a household name in Australia. NOBODY calls them coolers. I didn’t even know what a cooler was when I moved to the U.S. The Esky brand was created by the company Nylex, but Coleman bought them out in 2009. In Australia you can’t go anywhere fun for the day without an esky, which is why it’s so vital that you learn this word! Going to the beach? Pack the esky! Hosting a barbie? Ask a friend to bring ice for the esky! Going to the Big Day Out this year? Definitely bring a few eskys for all the beer water you’ll drink. Here’s a video of a remote controlled esky. Normally I don’t condone this type of commercial, but I know my dad and his friends will find it highly amusing. Meaning: I don’t know anyone who hasn’t chucked a wobbly at some point in their life. Children are very fond of wobbly chucking, as are the more fragile-natured among us. There is no age limit for chucking a wobbly. Chucking a wobbly means to throw a fit or have a tantrum about some trifling matter, hopefully in front of one or more people. The more people, the better. Typically, wobblys are at their best when caught on video and uploaded to the Interwebs. Wobbly chucking is often motivated by a one-sided unfair or unjust situation that the wobbler can’t do anything about. It’s like that time when my dad video taped me and my brother having a pillow fight in the back yard. Circa 1993, I was (and actually still am) older than my brother, I was about a foot taller, in a different weight-class, and stronger than he (that all changed ca. 2000). I’m also highly competitive, so when dad persuaded me and my bro to go at it for a few rounds with the pillows, I thought it was a terrific idea! 2 minutes and some flying goose down later, I was strutting around like Oscar De La Hoya and my poor little brother was crying, mouthing off to dad, and giving the camera his best one finger salute. It was family video, wobbly-chucking GOLD! I really need to get that VHS dubbed to DVD, stat. Meaning: The shed or a small, typically self-sufficient, apartment that’s on your property, but not attached to the house. A guest house, if you will. 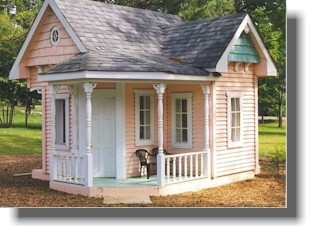 Granny Flats are where you put your Grandma/Grandpa, or Mother In-Law when she/he/they come to stay for long periods. Or if they move in with you, you can put them in the Granny Flat so they can still have their own place, but still be close by. A Granny Flat can be as simple as a garden shed with a cot set up in between the gardening tools and wellie boots. Or it can be a larger room with bedroom furniture, but no bathroom or kitchenette. Even more luxurious, the Granny Flat can be a fully-fledged guest house with all the amenities of a regular house, but on a smaller scale. I spent my last year of high school living in my Granny Flat. It was awesome. I could come and go as I pleased, I could study in quiet and I covered the walls in random posters of boys from Cleo Magazine. When I moved to Knoxville at the end of the year to attend UTK I think it took my brother about 15.8 minutes to gather up his belongings and conquer my beloved annex. Oh well. Sharing is caring. Meaning: swimsuit. Also known as “togs” or “bathers” depending on where you’re at in Oz. Usage example: Leave your cozzies at home people, we’re going skinny dipping! Just kidding, please keep your clothes on. Australia is known for many things, and one of those things is surf lifesaving – The Australian Baywatch, but with more exciting coloured cozzies. Surf lifesaving serves a vital role in keeping ocean swimmers safe from (or at least aware of) sharks, jellys, drop bears, rip tides, and so on. The surf lifesavers are typically members of clubs – each club works a different beach area. And each year the clubs compete in a series of high stakes sporting events. These sports include the world-famous Ironman series, Flags, IRB (inflatable rescue boat) racing, and more. Flags is a funny little event that’s designed to test speed and agility (which translates to better lifesaving in the event of a real emergency). Here’s a video of a flag race – these finely tuned cozzie-wearing athletes compete in a series of elimination heats to secure the flag at the end of the sprint. It’s like musical chairs, but instead of sitting down, the competitors are belly diving into sand. It’s moments like these that you want to make sure you’re wearing a high-quality, gonna-stay-put cozzie covering your bum. Check out 1:59 on this video from 2000 for a tasty, exciting moment (slo-mo replay follows). And here’s another clip of a women’s flag competition from 2008. This competition is pretty intense – there’s a “run off” at the 3:24 mark: Two of the competitors grab the flag at the same time and the refs can’t decide who yoinked it out of the sand first. My money was on the serious-looking Blue Knickers lady from the Kurrawa club. Who are you betting on winning? Pronunciation: tuck-a (rhymes with…nothing for you Americans. Just…well, instead of pronouncing the “er” at the end, say “a” instead. Meaning: Lunch. Or food you bring with you on a day trip when you’re not at home or at a restaurant to make or order something. A tucker box is the lunch box or bag you carry your food in. Usage example: “Do you have your tucker with you? It’s gonna be a long drive to Oodnadatta if you don’t!” Incidentally, one of my most beloved places in the world is Oodna-bloody-datta. If you’ve never heard of it, that’s ok, you’re in the majority. If you want to learn more about it, check out the Pink Road House website. 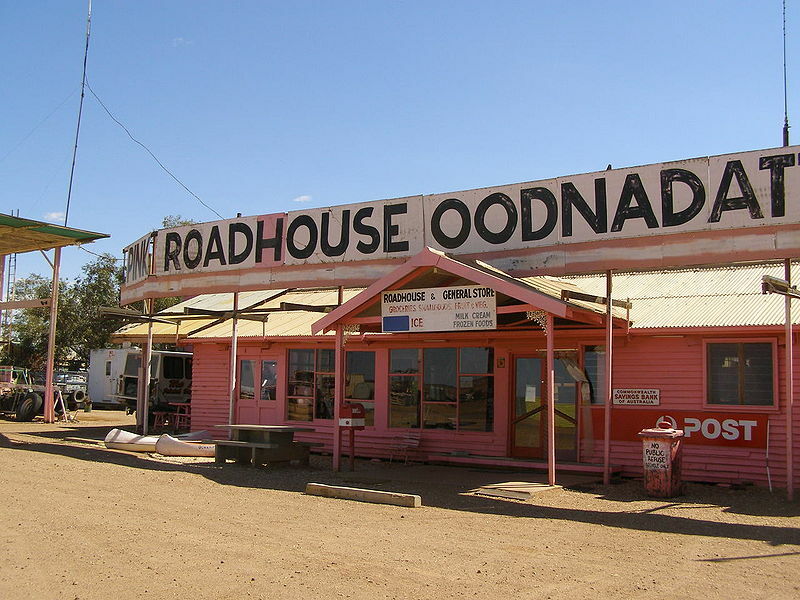 The road house is a major tourist attraction and central hub for Oodnadatta. The population hovers around 150, so it doesn’t have much competition. I had a mate in high school – Alice – whose family ran the road house and still does. Lovely people. I was luck enough to go up there for about a week with her for a high school spring break one year. She tried to teach me how to ride a dirtbike, but I sucked at it. That’s ok though, I still had fun. Protip: You haven’t experienced Australia until you’ve been out under the stars during a cloudless night sky in the outback. True story. The Pink Roadhouse. Everything is pink. Even the tractor. Meaning: Although it sounds like the start of a bad joke, these three things don’t actually walk into bars. They live in bars. They’re different sizes of glasses for beer. Depending on which Australian city you’re in, the names will be different. In Adelaide (a.k.a. Radelaide) a “butcher” is a small 200ml (7 oz) glass of beer. Back in the day, when the local butcher would take a break from cutting up meat, he’d nip out the back for a quick drink and then be back to work without being too sloshed. In Sydney and Darwin a butcher is known as a “seven,” and in Brisbane, where boring people apparently make up the names for things, it’s known as a “beer.” Yawn. A “pot” is a 285ml (10 oz) glass of beer in Brisbane and Melbourne, but it’s a “schooner” in Adelaide. It gets more complicated when you venture outside of Adelaide though, because everywhere else in Australia considers a 425ml (15 oz) glass of beer to be a schooner. In Sydney a pot is called a “middy,” and in Hobart it’s called a “ten.” You have to be careful to ask for “a ten of Carlton” and not “ten Carlton,” or you might have to call a taxi home (true story). Apparently the only name that all Australian beer drinkers can agree on is a “pint” which is 570ml (20 oz). Fortunately, much of the confusion with these various names and sizes is avoided by Australians simply hardening the f**k up (NSFW) and ordering a pint in the first place. PROTIP: When you visit Australia, you’re inevitably going to want to, or be forced to drink some beer. Don’t drink Fosters – we export that stuff. Do you see Mexicans drinking Corona when you visit Cancun? No, I didn’t think so. Instead, when you walk into an Aussie pub, take a quick squizz (a look) around and figure out what the locals are drinking, then order that. In Adelaide, you’re going to want to order anything off the Coopers menu. In Melbourne, fix yourself up with a Victoria Bitter. When you touch down in Perth, head straight for the Beez Neez (or anything from the Mathilda Bay Brewing Company). In Queensland, make sure you sample a Bundy or a XXXX (pronounced “Four X”). In Sydney, grab a Tooheys, and in Darwin, get whatever is available. Pronunciation: Fanginnit. Try to say it as fast as possible with a silent “g” at the end of fanging. It should really just be one word. Meaning: To get around or explore a location in an uncouth manner. Australia’s got some pretty interesting places worth exploring. But unlike America, where Interstates seem to connect everywhere you want to be, a car isn’t always practical. Resourcefulness is a good skill to have. Sometimes you need a troopy. 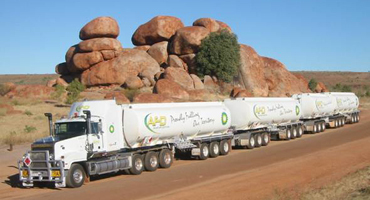 Other times, you might need to hitch a ride on a road train. Or maybe, just maybe, you can make do with a bike. And now I’m off to see Cirque Du Soleil’s acrobats fanging it on the trapeze! Have a great Friday everyone.